Creative director Jean Guesdon on designing an authentic map for the franchise’s new adventure. There’s a routine that Irish comedian and Go 8 Bit presenter Dara O’Briain performed a few years ago that’s always stuck with me. It touches on the idea that the average person’s worldview becomes rapidly simplistic the further afield any country in question is from them; a rich culture of peoples and lands boiled down to two or three basic concepts. As technology progresses and access to the globe and its multi-region, multi-cultural histories are a mere touch screen away, it’s a routine the grain of truth in which gets more shameful as the years past. We should know – I should know – more about our neighbours. And I’m not talking about the ones you can wave at from your backyard. So, you say Egypt, and I think two things: deserts and pyramids. Admittedly a pair of defining features to the region, but not the sum total of its parts. Hence I stopped longer than should have been necessary outside Ubisoft’s E3 booth, drinking in the beautiful banner for Assassin’s Creed Origins that hung overhead. 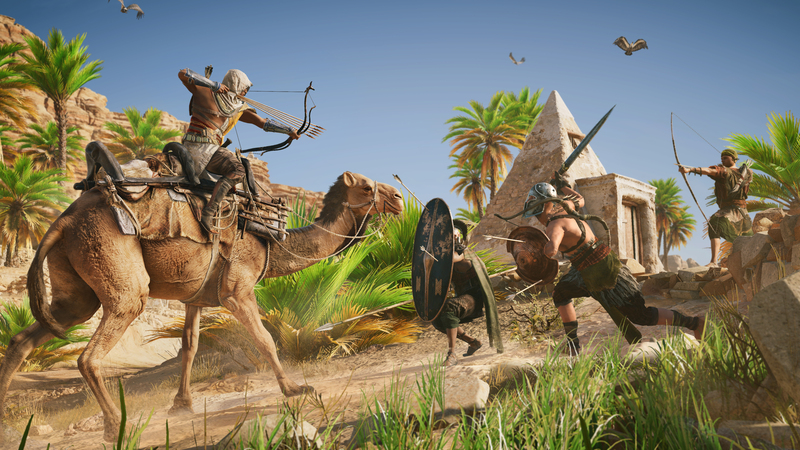 It showcases new lead Bayek astride a camel to one side. But both are but a minor detail as the eyes soak in not only the lush valleys, rivers and towns, but also the diversity of colour that dominate the landscape shot. The time-travelling series has always used its setting primarily to have an eye-catching locale for its adventurous romps of silent takedowns and multi-century warring of opposing factions. But that fiction has always been built on the foundations, and fought over the rooftops of, real-world history. Or at least a close approximation of it. However small, there has been an educational element to these time hops – Jerusalem, Italy, Paris, London – with the studio(s) behind them rendering the time and place with as much authenticity as possible. 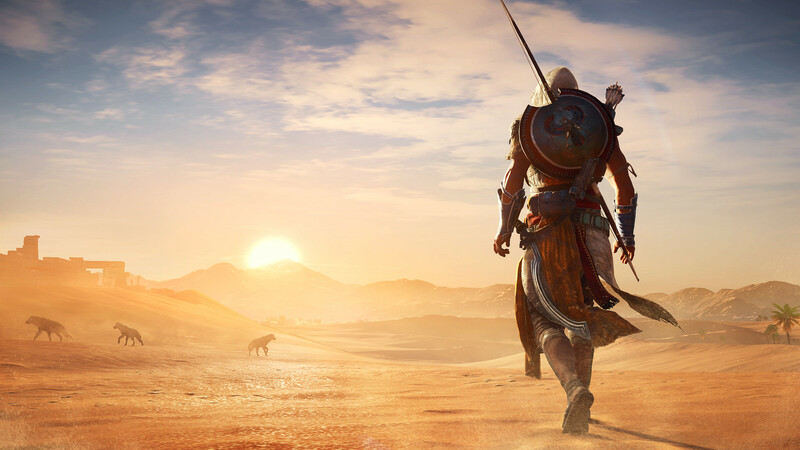 The research that followed is possibly the most intensive any team tied to the Assassin’s Creed franchise has had to do, as, Guesdon freely admits, “very few things remain today” of what was there at the time that Origins is set. Guesdon and his team at Ubisoft Montreal – and aided by Ubisoft Singapore – have crammed in all that history into a gigantic map. They started with the bigger picture, then worked downwards, “from global to detail” as the director puts it. The studio first dropped in simple grey boxes, travelling between them at the speed of a horse to fine tune the volume of content and make sure its deployment of population centres stayed consistent with the real world location. The map was then divided up between teams. Each used concept art as reference to define its region’s mood, lighting, materials, vegetation, fauna. To echo Guesdon, to “recreate the atmosphere” rather than duplicate what was there. 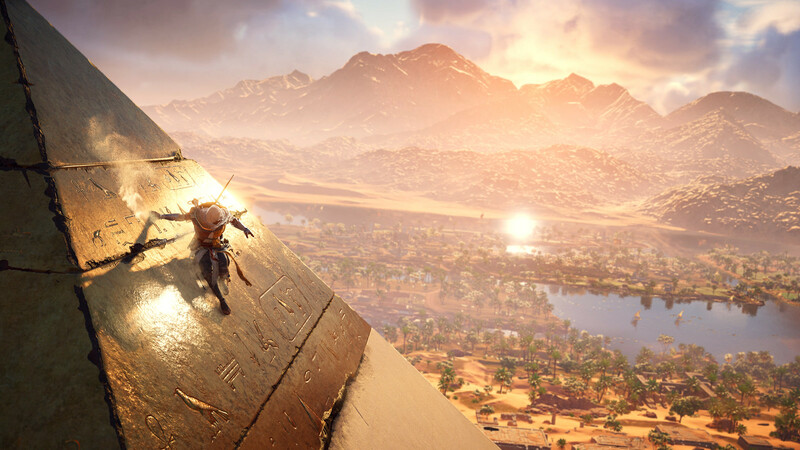 In previous Assassin’s Creed titles, it wouldn’t be unfair to say most players look for the nearest high point of the map and make a beeline for it. In Origins however, vertical isn’t as prominent, or as important, as the horizontal. You take a quick sip of the landscape. Then, thirsty for more, you trek into the great unknown. Not surprisingly, given the team behind it is also responsible for Assassin’s Creed: Black Flag, journeying to the distant horizon is a richer and more intriguing experience than gaining an overview from on-high like an eagle. Ubi’s looking to expand their player base. Well, they’ve succeeded! I’ve never bought/played an AC game (just messed around with the demos over the years), but their changing it from an Action/Adventure to an ARPG (with loot & everything!!) has me excited to pick this up! 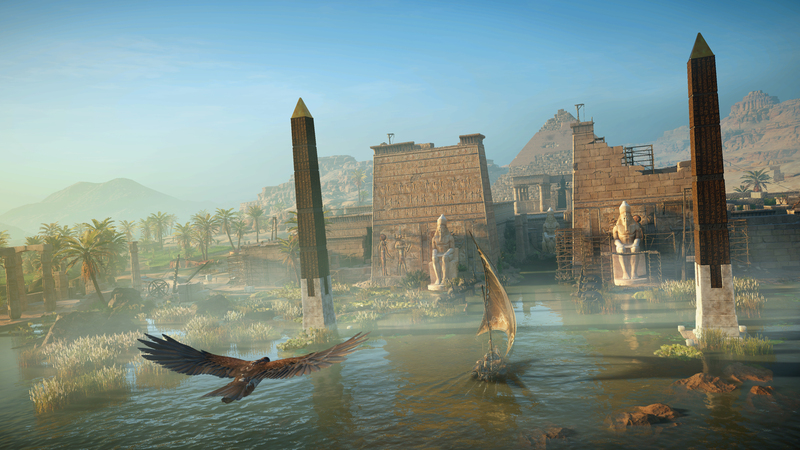 Some enterprising soul needs to make wall murals of some of these screenshots – I’m particularly thinking of your second shot from the top (the one with Senu) – I’d buy one!! Game world looks great, but the Assassin’s Creed series is about the worst teacher of real history imaginable. You’d be surprised of how spot-on their “version” of real history is…like for real your jaw would drop.